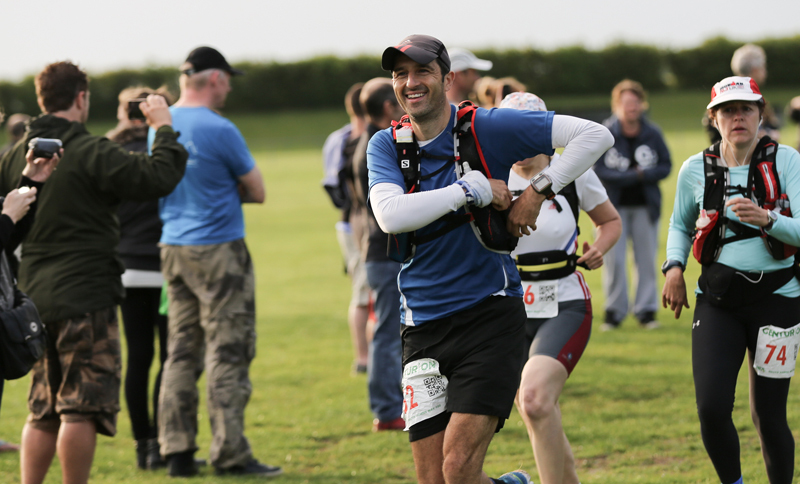 The South Downs Way 100 is the second of the Centurion 100 mile races of the year and involves a run from the start at Chilcomb Sports Ground in Winchester through the South Downs National Park to the finish in Eastbourne. I was feeling pretty jaded after a tough time (badly blistered feet, knee injury and a lack of sleep) at the Grand Union Canal Race 3 weeks earlier. Fortunately, the knee had responded to a bit of rest although the feet were still a little tender from the earlier blisters and the body was feeling tired and lethargic. Mentally, I was a probably a little demotivated and fatigued. With all this in mind, I decided to take it pretty steady from the start and just keep running as long as I could. I had a 21–23hr race plan mapped out so my pacer (Tim) had some idea of what time to meet later and this gave me some contingency for the sub 24hr buckle. I had decided to drive down in the morning as the start was only a 45 minute drive away from my house but only managed a partial night’s sleep thanks to some huge thunderstorms the night before which kept me awake for an hour and the subsequent 4am alarm call. I drove down to the start expecting to arrive in plenty of time but arrived a bit later than planned after spending a few minutes driving around what looked like the same roundabout (with stress levels rising as each minute ticked by) until I spotted the Centurion flag marking the lane to the start. Russ Bestley was pulling a triple shift this weekend combining roles of car park attendant, checkpoint volunteer and pacer for a buddy as I saw him at several different points in the race all in different guises. I parked up, went through kit check, delivered my drop bags saying hello to Paul, Drew and Claire who were on duty then said hello to several other runners including Stuart Mills who was dropping his bags in behind me. I didn’t really have time for breakfast and I didn’t feel like eating that early and so packed a large sausage baguette in my backpack to eat a couple of hours into the race. Race Director James gave his race briefing 15 mins before the start of the race and with a few minutes to go I felt the need to use the portaloo’s and waited in the queue. The countdown to the start of the race continued as the queue for the toilets started to diminish but it was going to be a close call. In fact, I actually started the race (and my Garmin) whilst sitting in the portaloo and then headed out around the field trailing behind the mass of competitors ahead. 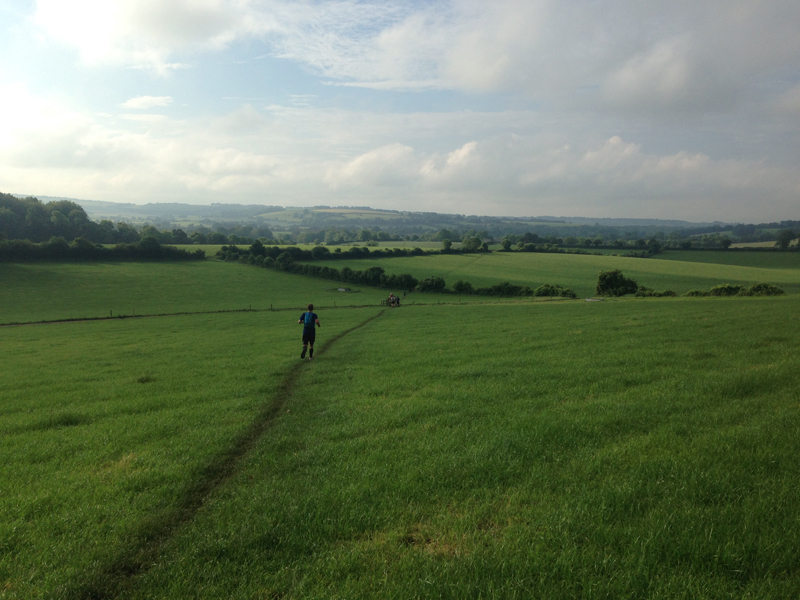 We completed the lap of the field where there were a couple of choke-points which allowed me to mix in with the bulk of the runners at the back of the field before we made our way out onto the South Downs trail. Start to Checkpoint 1 (Beacon Hill Beaches 11 miles). I jogged along at a comfortable pace initially with Sue Albiston who was taking on her first hundred miler following a long trail of around 250’ish runners (which she finished, well done). Despite the rainfall during the night the sun came out and it warmed up quite quickly and I paused briefly to remove my base layer. I drifted past a few runners as we made our way towards the first checkpoint chatting to a few people on the way. 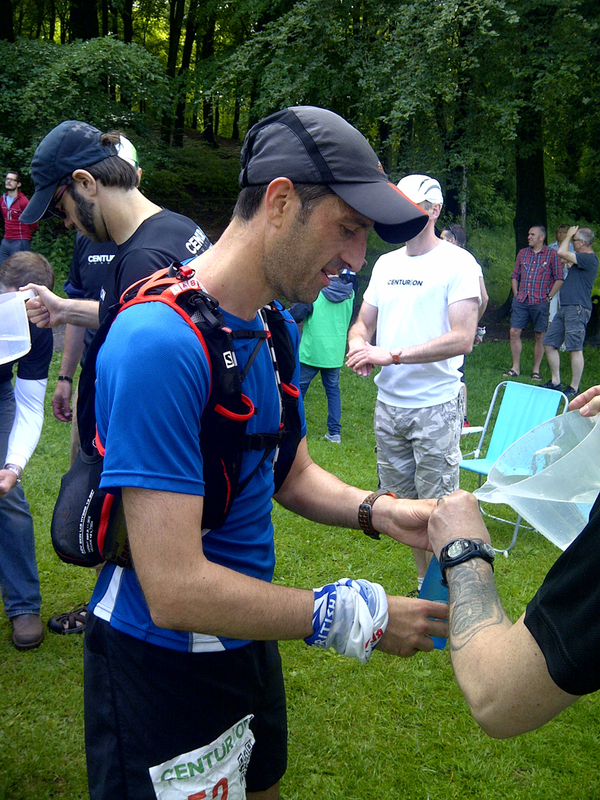 At the first Checkpoint I topped up my water supplies briefly, grabbed a few snacks and carried on. I recall some of this section being quite muddy and wet. I had worn my sealskinz socks primarily because they were my most padded sock and my feet were still feeling a little tender from the GUCR and they did a good job of keeping my feet dry here. I caught up with Nicole Brown around the 13 mile point and we jogged and chatted together for a little while before I drifted on ahead. I realised that I hadn’t eaten anything about half-way to the next checkpoint and decided to dig out my sausage baguette and began to munch my way through this for breakfast. The route had been a lot of up and downs and from the start of the race I had planned to “hike” (I actually mean “walk” but the term “hiking” seems less wimpy) up the hills and jog the flats and downs. This meant that the race was broken up with a mixture of running and walking and the pace was steady from the start. I ran a little way with Kirsty Reade and briefly chatted before drifting ahead as I arrived at Checkpoint 2 and again topped up my water supplies as I was drinking a fair amount of water with the warm weather. 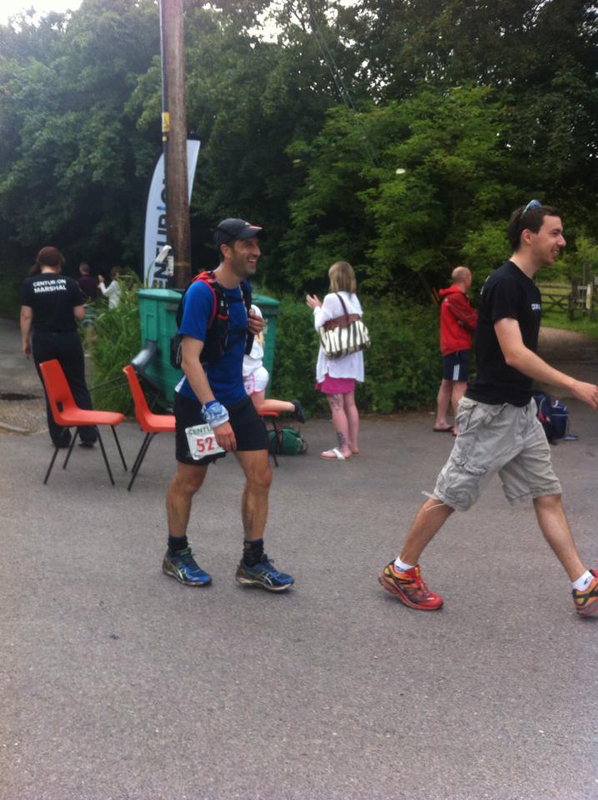 I bumped into fellow Reading Jogger Ken Wilcox who was crewing another runner and he kindly grabbed this picture of me. This was a short leg of less than 5 miles and I marched out of the Checkpoint snacking on some food close to Luke Ashton and Peter Bowles. About a mile or so after the Checkpoint we experienced our one navigational issue of the race. 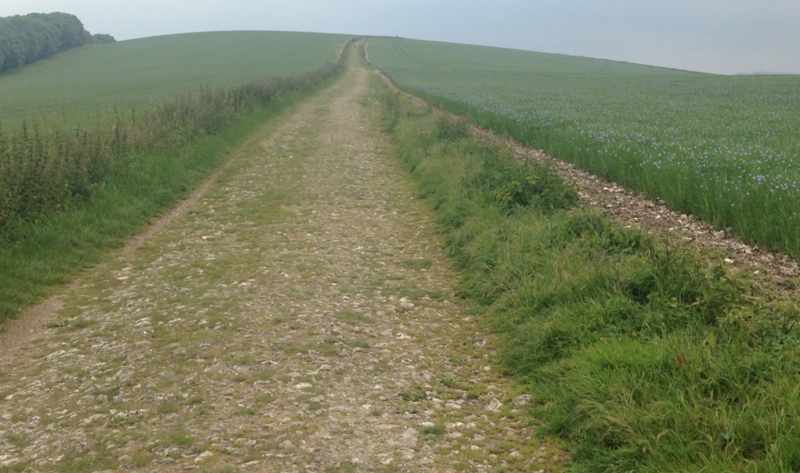 I was trailing behind Peter Bowles and another runner ahead of him and they took a left down a bridleway off the South Downs Way path, there was some tape marking on this turn suggesting this was the correct path. I had the course loaded onto my Garmin and tend to leave it in navigation mode as a check that I’m going the right way but a short while later the Garmin beeped to indicate I was off course. Luke came up behind me and we halted to check our maps. We saw Peter ahead and called him back to check if we were on the right route as he mentioned he had done this course previously. We pretty quickly decided we had gone off course (I should mention my genius moment of checking where we were on the maps we were carrying and finding Aid Station 2 on the SDW50 route I had marked initially!) and retraced our steps to find a way marker indicating we should have gone straight on and ignored the rogue red and white tape (which may have been related to another race on that route). Unfortunately, the runner ahead of Peter was out of sight and no chance of catching him or calling him back. So after a few minutes of double checking our position, we headed back onto the correct route as various groups of runners ran past us which included Nicole again and so we ran along together for the next few miles. I drifted on ahead at some point and continued up and over the Downs before spotting the Checkpoint a mile ahead after a long downhill stretch. The on call ambulance parked by the Checkpoint was a nice giveaway! I arrived at the Checkpoint in a field which resembled a car boot sale with the number of cars ready to meet their runners and bumped into Gil Elomari and Ian Thomas at the Checkpoint (Gill marshalling and Ian running). It was pretty warm here and I was delighted to find some (melting) ice-cream at this point and tucked into a cup of this which went down rather well. I spotted Ken Wilcox and Lisa Hewitt a couple of times who kindly snapped some photos of me which I’ve used on this report with their permission (thanks guys). 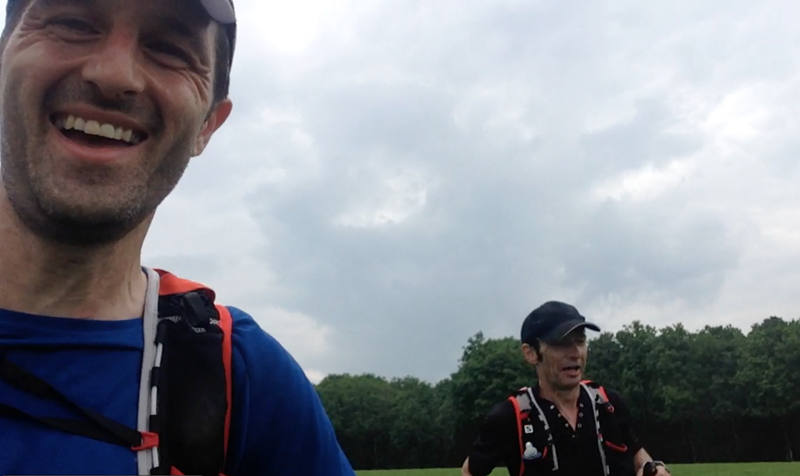 I set off from the next checkpoint with Ian Thomas not far behind me and we then ran together for a few miles. 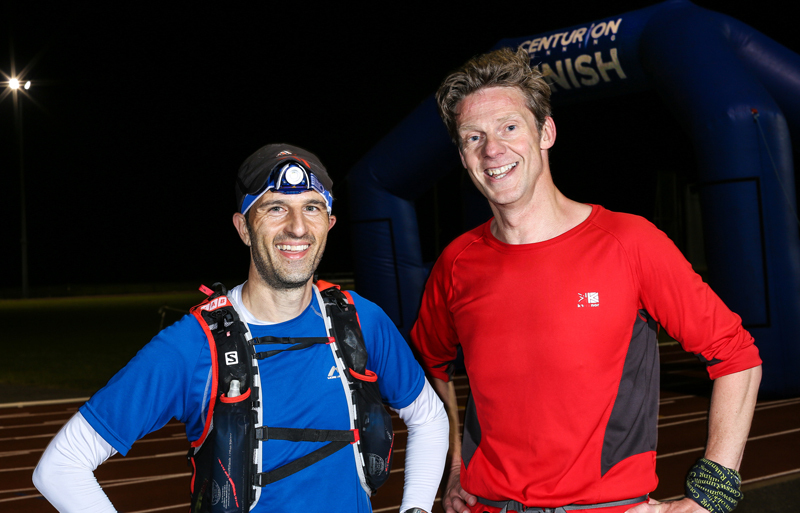 Interestingly both Ian and I had completed the TP100, GUCR and now the SDW100 in 6 weeks (along with Ellen Cottom) and it was somewhat comforting to hear he was also feeling a little jaded from three races in a short space of time. The next checkpoint if I recall correctly was a small tent in a field and I once again topped up my supplies, grabbed a few snacks and marched out of the checkpoint to eat some food on the way. This felt like a pretty good leg with some good downs which means a reasonable amount of running and the miles ticked on by. I can’t recall a lot of this leg to be honest. The weather deteriorated between these checkpoints with dark clouds closing in and the odd spots of rain. I was pretty much running by myself at this point with few people ahead or behind in the distance but I was pretty content with my own thoughts as I plodded on and had no need or desire to put on my iPod. I still had a reasonable amount of running in me so the steady start and regular hill walk breaks were definitely helping keep me plodding on at a steady pace. As the rain got a little heavier I decided to put on my S-Lab light jacket which I carry as a backup but as soon as I stopped to get this out my pack the rain came down a lot heavier and I got out my full waterproof jacket just in time as the heavens opened for 10-20 minutes. I could almost hear Nici Griffin cursing my lucky hat somewhere in the distance. The rain thankfully eased off and I removed my jacket and continued on towards a small aid station marking the half-way point. I arrived here at about 3pm in the afternoon (9 hours into the race) and paused briefly to drink, top up supplies and eat a few snacks. I set off from this checkpoint walking the gradual incline and eating some food a little behind Ken Fancett in the distance. 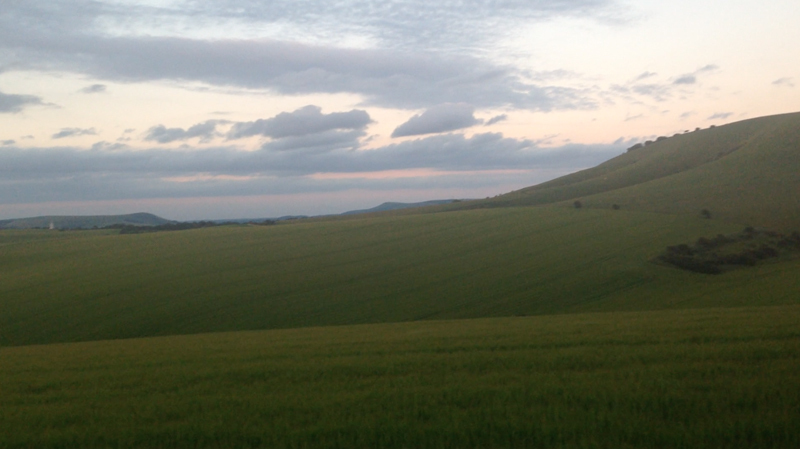 I was aware that there would be a deviation off the South Downs route before the next Checkpoint to avoid the A24. About a mile after the checkpoint I came across another left hand turn seemingly off the South Downs Way route with a red and white tape marking. Having fell for this just after Aid Station 2, my instincts and map information suggested this was another bit of rogue tape and as another runner caught me up, we decided to carry on which was the correct decision as we came across more taping and way-markers. A little further ahead we passed a group of teenagers out on some hike sitting around taking a break who called out “You got this guys!”. “We’ve still got another 50 miles to go I responded” with a smile and then leaned towards my fellow and whispered “But to be clear, we HAVE got this”. It didn’t take too long to cover this section and I ran into the village of Washington passing Ken Wilcox again who grabbed another photo and onto the checkpoint which was a crew point meet and busy with lots of people, support and applause. I bumped into Karen Webber and Ewan Dunlop who were crewing and Javed Bhatti also grabbed this picture of me. This was my longest stop as I had some hot food, a milk shake and bottle of coke from my drop bag and collected my head-torch. This stop was an indoors and had access to a proper toilet which I took advantage off, it’s nice to run out of a checkpoint with clean fresh hands! My knee was ok, my legs were a little stiff and sore but no unexpected after 54 miles but my feet were feeling very sore. I also sent a text to my pacer Tim Grant who was planning on meeting me later on to let him know that I was on the quicker end of the 21-23hr timings I had sent him. 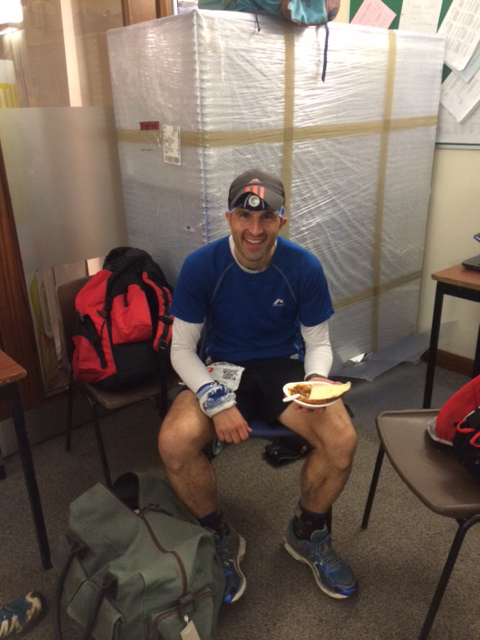 I marched out of the checkpoint eating some grapes as Ian Thomas and a few other runners ran into the checkpoint. I can’t recall a lot of this section to be honest but it would have been late afternoon/early evening by now. There weren’t too many people around by now but odd parts of the route became a little familiar. I think this section was more rolling with gradual ups and downs which meant I was running a fair amount of this section and was keeping the average pace around 11m/m for this section. I could feel some hotspots on the soles of my feet but the discomfort was bearable. I arrived at the Saddlescombe Checkpoint to find I was the only person there and sat down for a few minutes to eat and drink and take the weight off my feet which were now feeling really sore from all the pounding. I think my feet had also swollen as they felt tight in the shoes and the toes were pressing up at the end which wasn’t helped by a thick sealskinz sock but I didn’t think these felt bad enough to change and preferred more than less padding. I was wearing road shoes for the run and not sure whether the extra cushioning was better or worse than a trail shoe with a rock-plate to protect the feet? As I ate some food another runner (I forgot his name, sorry) walked back into the Checkpoint having left it earlier and immediately announced his intention to retire complaining he had been feeling nauseous and admitting mentally he was struggling a bit. I did a bit of a good Samaritan job and encouraged him to sit down eat, rest and then think about plodding on as he was hours ahead of the cut-off and could easily walk it in. 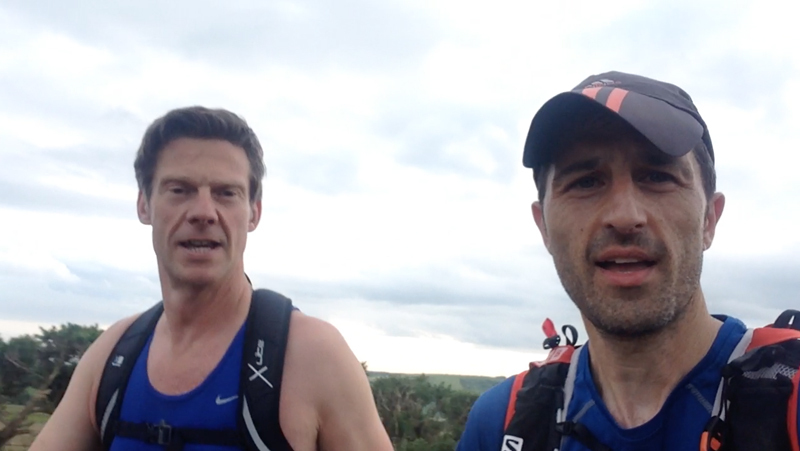 My final line of “How do you think you will feel tomorrow, if you quit now?” was delivered as I left the Checkpoint and probably sealed it… as 10 minutes later I turned round to close a gate and saw him running up the hill behind me and gave him a wave. (Rob Pinnington take note). Tim was meeting me between these checkpoints and we exchanged a few texts to confirm his position which wasn’t very far ahead and met him near the A23 just after you cross a bridge to get over the road. It was around 6.30 pm and so we were only 12.5hrs into the race and we still had a few hours of light to look forward to. I updated Tim on progress so far (ok overall) and advised him that the plan was to continue hiking (walking) the uphill sections and running the downhill sections at a steady pace and keep it going as long as we could. We continued on and it didn’t take long to get to the next Checkpoint to see Bryan, Dan, Graham and Allan Rumbles here. I picked up my next drop bag which contained another milk shake, bottle of coke, some savoury snacks and spent a couple of minutes taking the weight off my battered feet before marching out again with Tim. 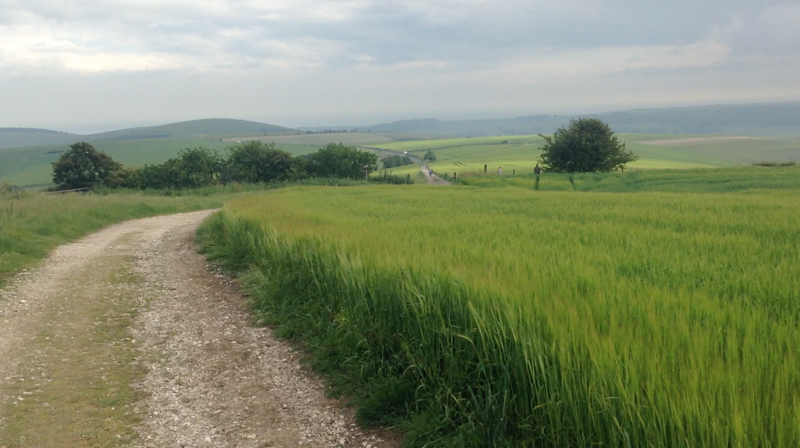 The course and scenery around here was lovely, with rolling hills, grass and greenery for miles around. We reached the 75 mile point around 8.30pm which I had hoped to achieve in the light and still had another hour or so of light to cover a few more miles. There weren’t that many runners around us by now but we did start to leapfrog Karen Hathaway and Emily Gelder who I hadn’t met before and were running together. We pretty much kept leapfrogging them (and vice versa) for the remainder of the race and it was good to catch up and share each other’s race experiences (they are both very good athletes!). We arrived at the Petzl branded checkpoint and I sat down briefly to eat some food as Karen and Emily came in and left pretty quickly. I ate some food, had a few cups of coke and then Tim and I set off again overtaking one more runner who looked like he wasn’t having a great time of it at that point. The light was starting to fade by now and progress slowed a little but we were still marching the up sections and jogging the down sections but perhaps the approach on the flat sections was a little more debatable! Eventually the light faded and we paused briefly to dig out our head torches. I was using my trusty Lenser SE07R and as they are so lightweight I actually carry two of these so one can act as my backup. Even in the dark, the course markings were fine with regular markers and arrows in addition to the South Downs Way markers. As we approached the next Checkpoint I recognised the bridge just before the train station as Karen and Emily caught us up (having played leapfrog a few times) and we spotted Shaun directing people at this point. We stopped at the Checkpoint at the Farm and grabbed some food and snacks before marching out again. I knew the start of the next leg involved a long climb over a ridge and up a hill. There were groups of teenagers out (some form of Duke of Edinburgh event going on?) who gave the runners some encouragement. We grouped up with Karen and Emily for a little while as we marched onwards. These last few sections felt like a lot more uphill than downhill sections which meant more marching at a very steady pace. I was keeping an occasional check on the time and it looked like we were heading for a 20-21 hr time if we kept this pace so pretty satisfied with that effort overall despite what felt like a lot of walking and marching during the event. We totally forgot about the England game until midnight when we checked the score and found it to be 1-1. However, by the time we got to the Checkpoint at Jevington it was 2-1 to Italy and pretty much game over which was a bit of a downer. The bubbly Nina Smith was here helping out as I tucked into some cheese on beans and drank a cup of tea before heading out for the last 9 miles, we were now down to single figures. 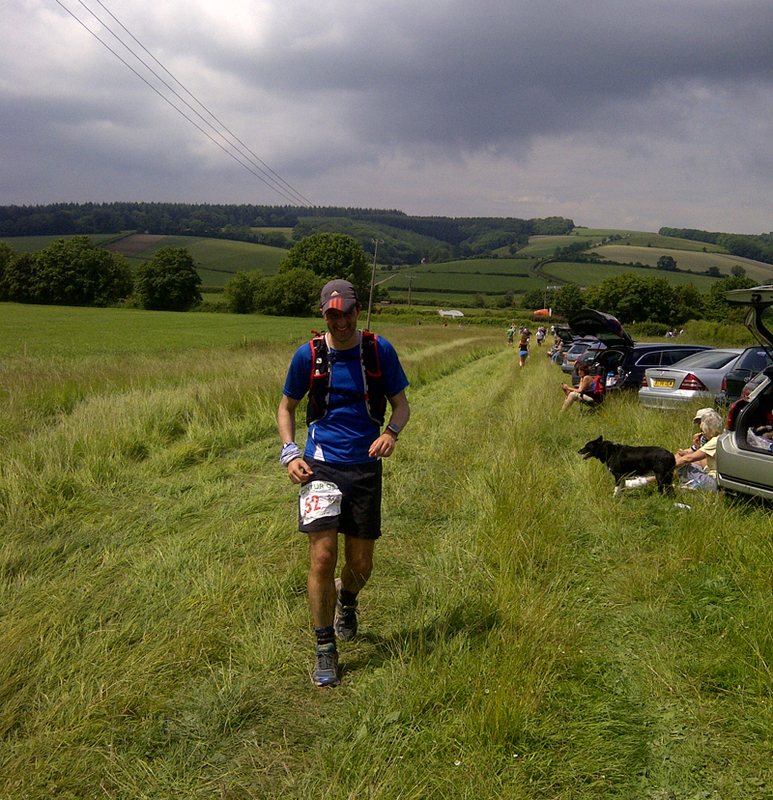 We left the Checkpoint and I was disappointed I didn’t spot Sam Robson’s spooky house (it’s not his, but he pointed it out to me on the SDW50) and carried on towards the last Checkpoint. It was more marching with the occasional sporadic run by now. I was flagging a little a bit at this point and took a Gel to ensure a little boost of energy but truth be told the last couple of races were probably catching up with me. Time-wise we were looking closer to a 20hr than a 21hr and if I had been a little more motivated I probably should have pushed a bit more but this time I took a more relaxed approach and well… didn’t bother. We arrived at the last Checkpoint but didn’t stop here with only a few miles to go. I quite liked the fact the Checkpoints were really regular, it broke the race up a lot more for me as long as you didn’t hang around too long! Tim and I headed up the last climb to the top of the ridge to see somewhere directing us along the diversion down the gully to the finish. We started to jog down this point but the path was a little narrow and I stumbled over and slowed before stopping for a comfort break as Emily and Karen jogged past us. We hit the outskirts of Eastbourne and made our way around the road past the hospital and took a left towards the Sports Stadium. I had pretty much ran out of steam now and we walked most of the last mile until we spotted the lights and sounds from the finish and I felt obliged to muster up a bit of a jog. As we entered the stadium we made a slow lap of the track to the applause and cheers of the guys at the finish who were trying to encourage a sprint finish. Pride got the better of me and after a quick nod to Tim to say “I’m going to play to the crowds demands here” I sprinted (well jogged a bit more quickly) around the last ¼ of a lap finishing in 20hrs 17mins as Tim came in behind me. We finished just after 2.15am in the morning still in the dark. Nici Griffin was on hand to usher the finishers to collect their medals and pose for some photos and the lovely Mimi Anderson was here awarding the medals. Overall, I was pretty satisfied with that time and had expected something a little slower before the race but the nature of the course, taking regular walk breaks and the fact that checkpoint distances didn’t feel too long all helped keep me moving. There’s definitely an opportunity to take a bit more time out of that course if I approached it fresh and it’s a really nice trail to run along. I did enjoy the finish in the Stadium (shades of a Western States style finish) and the location is great with hot food and showers at the end aswell as plenty of indoor space. 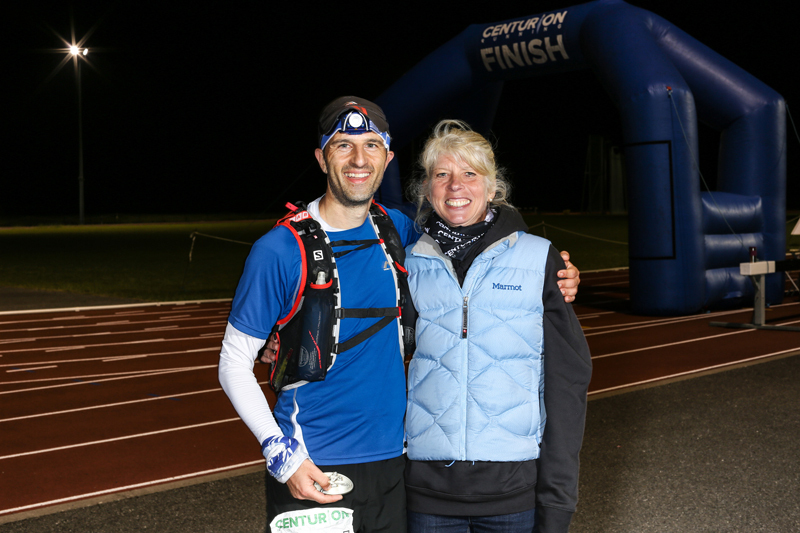 A quick word about Mark Perkins who smashed the course record finishing in 14hrs and 3mins (you really couldn’t have made it a 13hrs 59min finish?) which was an absolutely superb run. I finished in 28th place out of 250? Starters and 179 finishers. That’s the second of the Grand Slam completed and the one I was expecting the least favourable result due to other prior races. A quick word on the Grand Slam entrants. Unfortunately, pre-slam favourite Ed Catmur didn’t compete (due to an injury I believe) but a very strong run from David Ross (finishing in 15hrs 58mins) meant he has taken a firm grasp on the Grand Slam Championship with a 3hr lead ahead of second place Warwick Gooch. 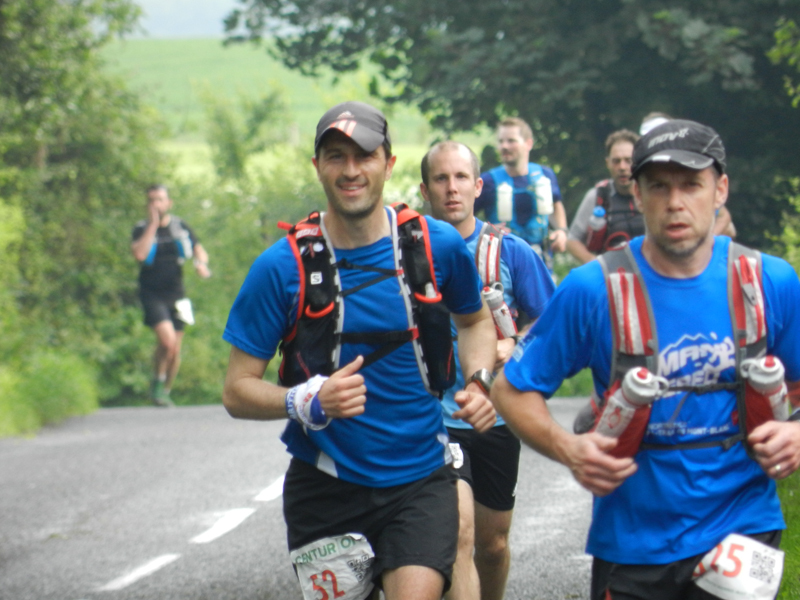 We had 41 starters at the Thames Path 100 which was reduced 21 after this race and we are now down to 17 potential Slammers after the South Downs Way 100. Knowing the calibre of some of the runners participating here, my main goal was firstly to make sure I complete the slam. However, I do think goal setting and motivation is an important part of running long distances and whilst there is only a handful of people who genuinely have a chance of a win, the rest of us have to come up with more personal challenges and I will admit to setting myself a a little personal target of trying to finish ahead of last year’s winning Grand Slam total (83 ½ hrs) which I thought would be a tough but achieveable challenge. I’m pleased to say that this is still achieveable but it’s fair to say I’ve done the easy two events with the harder two events (NDW – bit more hilly and Winter 100 – weather could be anything) to follow so we will see how it goes. It’s a bit of motivation to keep me going throughout the year as my main “A” goal was to sub 20 the TP100. Thanks to everyone who helped crew and support the race. I keep repeating this every time I complete a Centurion event but they are very well organised and well supported races which run like clockwork. For this race alone there were 85 volunteers operating throughout the race which is a massive operation so well done and thanks to everyone involved. Finally, thanks to my pacer Tim Grant for the company and running/walking the last 30 miles with me and giving me a lift back to the start. 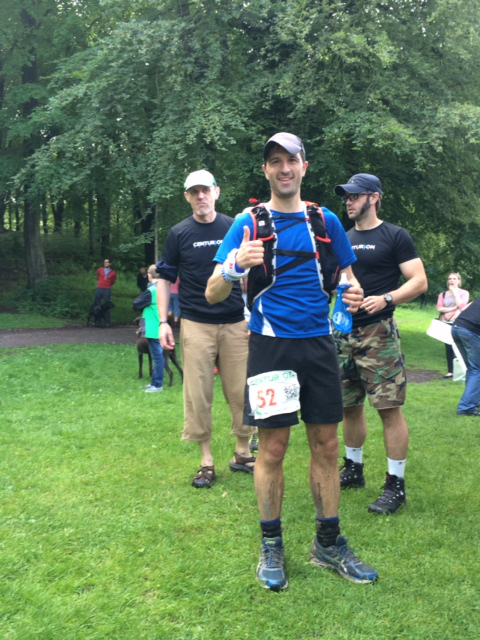 Tim thoroughly enjoyed getting involved in the event and is half convinced to give an Ultra event a go in the future aswell. SDW50 could be on the cards for him next year? Paul, I certainly do enjoy every one of your posts from here in Alabama, USA. You are a very talented writer and runner. As a 3 decade ultrarunner getting on in years (67), I still participate (slower), and love reading race reports such as yours. Hate to admit it, but I’m also a very avid Birmingham City Football fan. Been on hard times lately. Nobody around here cares one iota, but I do. Run long and run strong and good luck in the rest of the slam. Great running and blog…I’m still not sure if I want to run quite that far yet. 🙂 The scenery would be worth it though.